The Most Famous Melodies of All Time Arranged for Easy Guitar. Arranged by Matthew Cramer, L.C. Harnsberger, Jeff Klepper, and Howard Wallach. 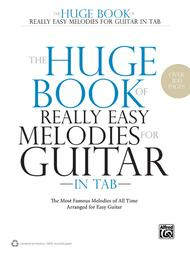 This edition: Easy Guitar TAB. Guitar Mixed Folio; Guitar TAB; Solo Guitar TAB (EZ/Int). Children; Folk; Masterwork Arrangement. Book. 288 pages. Alfred Music #00-40783. Published by Alfred Music (AP.40783). Every beginning guitarist needs a solid collection of melodies to expand their knowledge of music and make playing more fun. 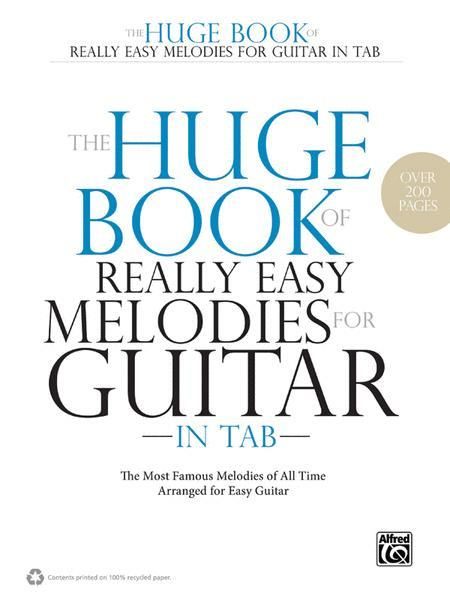 The Huge Book of Really Easy Melodies for Guitar in TAB features over 140 of the most recognizable melodies arranged for easy guitar. Arrangements are in simple keys and shown in both standard music notation and TAB to make learning quick and easy. Styles include folk, classical, holiday, patriotic, sacred, spiritual, international, and children's songs, and every arrangement includes chords so you can play along with friends or a teacher. Whether you play these songs in your lessons or learn them on your own, this collection is a must-have for all beginning guitarists.